The Residences at Hacienda Encantada marry Mexican tradition and modern luxury to provide the ultimate in lavish villa accommodations. Located on the most sought after portion of the Cabo Corridor, the resort provides an idyllic setting overlooking the Sea of Cortez and picturesque views of Land’s End. The resort is home to some of Cabo’s best restaurants, a spectacular spa and within view of the renowned Cabo Del Sol golf course. 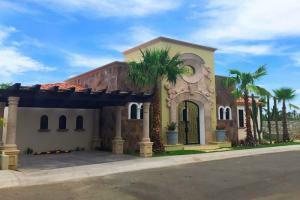 This resort is located at the tip of the Baja California peninsula on the Los Cabos tourist corridor, and is just 10 miles away from Cabo San Lucas International Airport. Las Marias - Authentic Mexican Food; La Trajinera; El Patio - Snacks and Drinks; La Pergola - Casual Dining; Los Riscos - Bar and Grill; El Eden - Authentic Mexican Food. Whale Watching, Dolphinarium, Golfing, Fishing, ATV Tours, Safari's, Horseback Riding, Zip Line Tours.